“O Tannenbaum, o tannenbaum…” How truly lovely are the branches of this year’s Christmas tree! (If I do say so myself.) Putting up our Christmas tree is always the Main Event (capitalization entirely intended!) of our holiday decorating, and there’s nothing I like better about getting ready for this season. 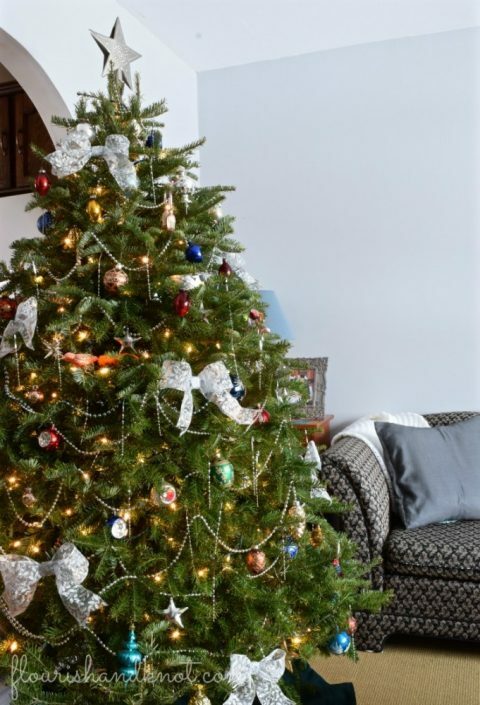 I take such pleasure in decorating our tree beautifully each year, so I am thrilled to be joining my blog friends to bring you an entire week’s worth of gorgeous tree eye-candy as part of the My Home Style hop. Our host, Stephanie of Casa Watkins Living, has done a great job organizing everything: make sure to stop by her blog to see her lovely tree! If you are joining me here at Flourish & Knot for the first time: welcome! Thank you so much for stopping by. I’d love for you stay a while and enjoy some of my other holiday posts, including yesterday’s big Christmas home tour. I’ll let the photos do most of the talking, and simply interject to explain my choice of home style words: elegant, vintage, and whimsical. This post contains affiliate links. When you click the link and make a purchase, I will receive a small commission (at no extra cost to you). I love my tree to feel classic and elegant. Shimmering glass ornaments, beaded garlands that catch the light, and simple white lights are staples. This year I added some organza bows for a little extra shine. The bows are really easy to make with wired ribbon like this or this. Many (if not most) of the ornaments we put on our tree are vintage and antique. Some are family heirlooms, and others I’ve collected on our travels or at flea markets. My favourites are these antique balls from Poland. I love to put some unexpected and whimsical ornaments on the tree. This year’s additions are these gorgeous glass birds from Austria. I’ve got a thing for birds (inherited from my grandmother), and my mom was kind enough to bring me back these beauties. 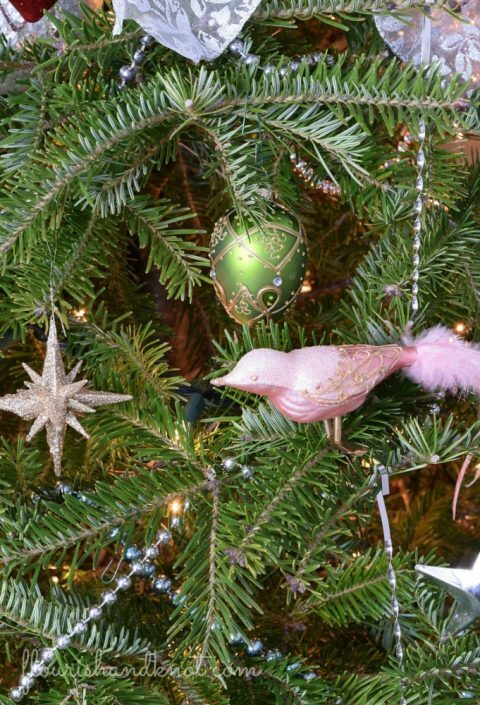 You can find some real vintage clip-on bird ornaments on Etsy here and here and here. Our star topper comes from Mexico. My husband’s family is from Mexico City, so it is wonderful to have them represented on our tree. 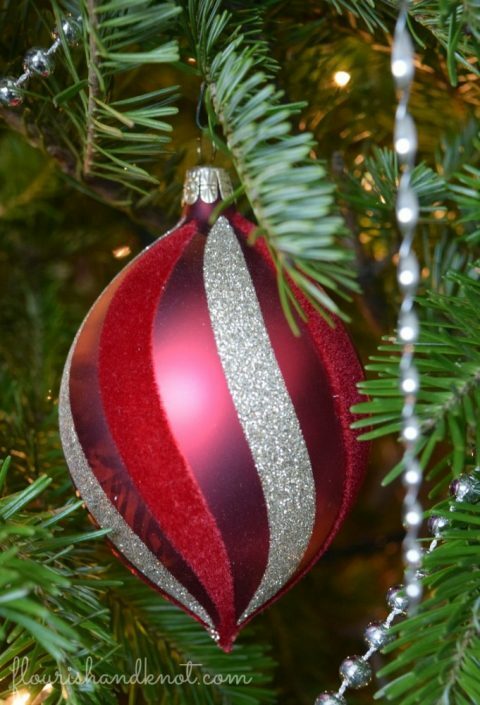 So tell me: do you decorate your tree with a theme, colour scheme, “feel”, or simply with ornaments you love? I guess I fall somewhere between those two last categories. 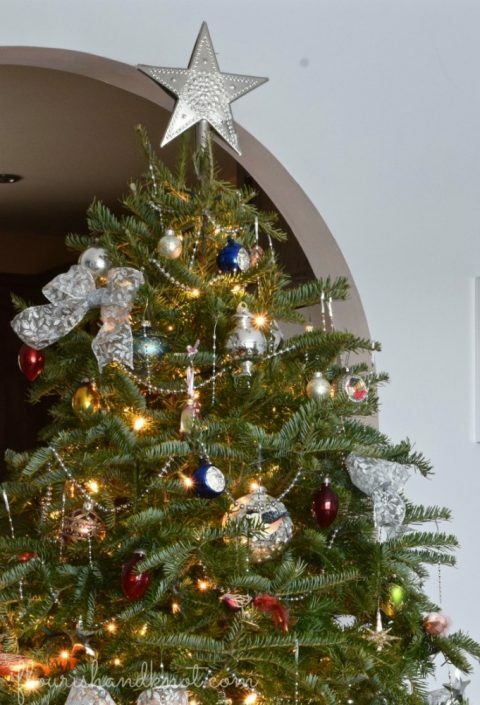 I hope you’ll take some time to hop around to see the other bloggers’ gorgeous Christmas trees. There is truly something for every taste and style in this hop! The next stop on your tour is A Designer at Home. Enjoy and Merry Christmas! 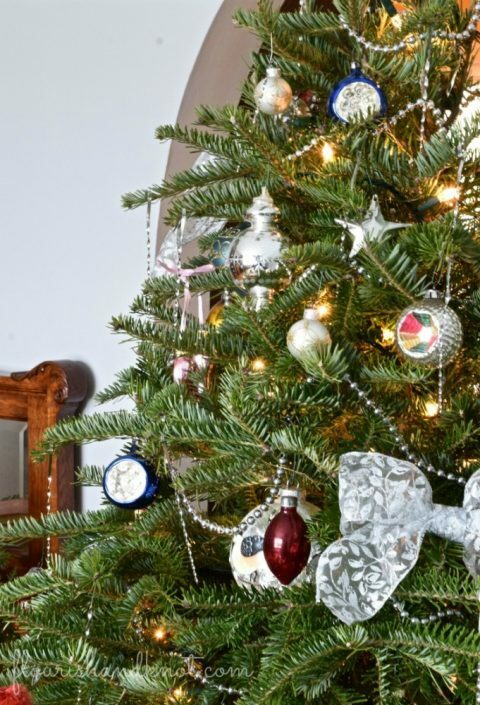 Your definately accomplished your mission….the simplicity and traditional aspects of your tree result in an understated elegance. Beautiful job! Hi Erica – thanks so much! I love a traditional look at this time of year. What a lovely tree you have this year! I am not usually a fan of bows on a tree, but those are really beautiful! And I like the fact that you have a real tree! Now…I need to get out and buy OUR tree, and get moving! Thank you! I’ve never done bows, but I thought I’d give them a try this year. It’s nice to change things up just a bit. 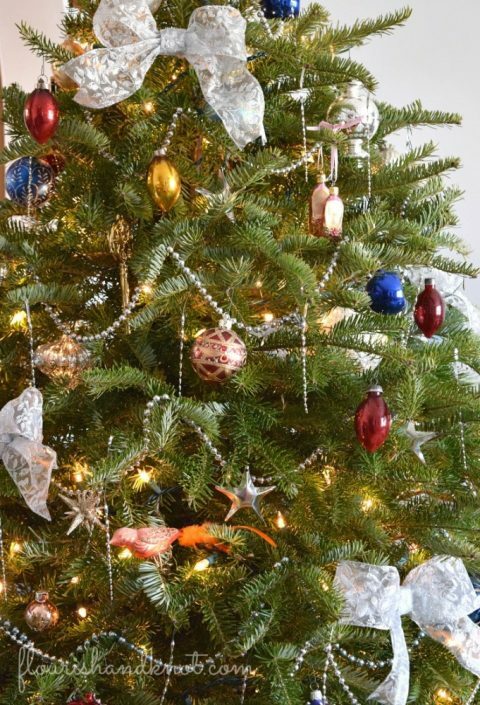 Can’t wait to see your tree – send a pic! What a beautiful tree! We definitely have a color scheme and “feel” for our tree, though I don’t know if I could put a name on it haha! Thank you so much – I love decorating the tree. 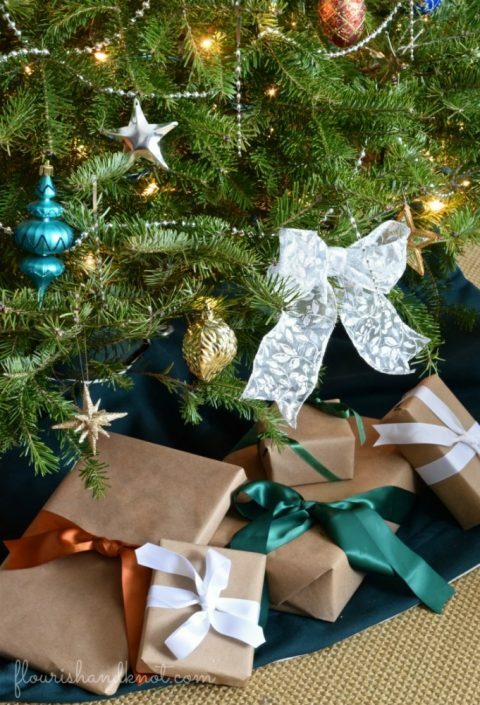 Can’t wait to see your tree! Looks great with the rest of your decor! such a pretty tree- love the whimsical draped beading! Your tree is just beautiful! 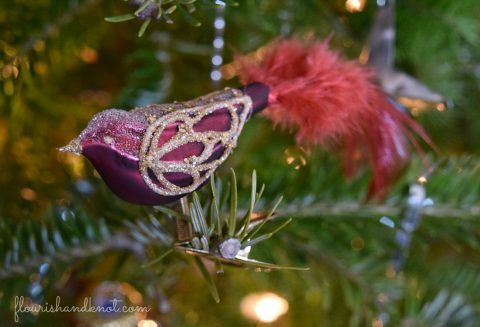 I adore vintage ornaments and I’ve always wanted a set of beautiful glass bird ornaments! Your tree is so pretty and simple. Also, I swear I could smell your tree based off of your up-close pictures of the ornaments. I’m glad you enjoyed the post and photos! I love the smell of a real tree. Thanks for reading! Absolutely beautiful! Some of the ornaments remind me so much of ones we had on our tree when I was growing up. It brought back such good memories. I hope your Christmas is a wonderful one! Thanks so much, Ali! I hope your family has a wonderful Christmas, too. Such a pretty and classic tree. Love! So pretty, Sarah! 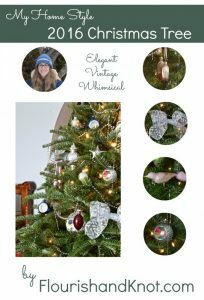 The vintage ornaments are beautiful! It’s so pretty! It looks so beautiful and shimmery! Love the beaded garland and all of the special ornaments. A classic beauty. So pretty! I love a traditional christmas too. I enjoy getting out all the family heirlooms as I am sure you do too. I love your tree! I think i need to bring back the simple garlands, it looks so classic. So pretty! I love the bead garland and all of the special memory ornaments! Such a pretty tree! 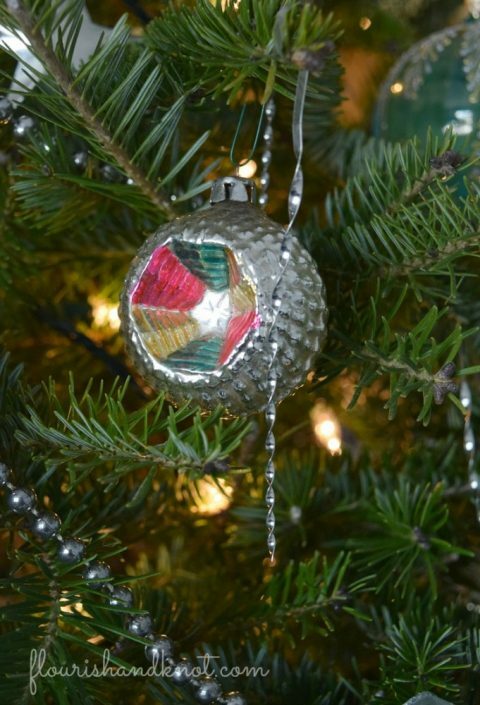 I love when ornaments have sentimental meaning – those are the best kind! So so cute! I love the pink ballet slipper ornament for sure. Such as pretty tree!